Create infrastructure with software stacks from architectural diagrams. Document and deploy them to your cloud infrastructure, at speed, whilst maintaining standards. 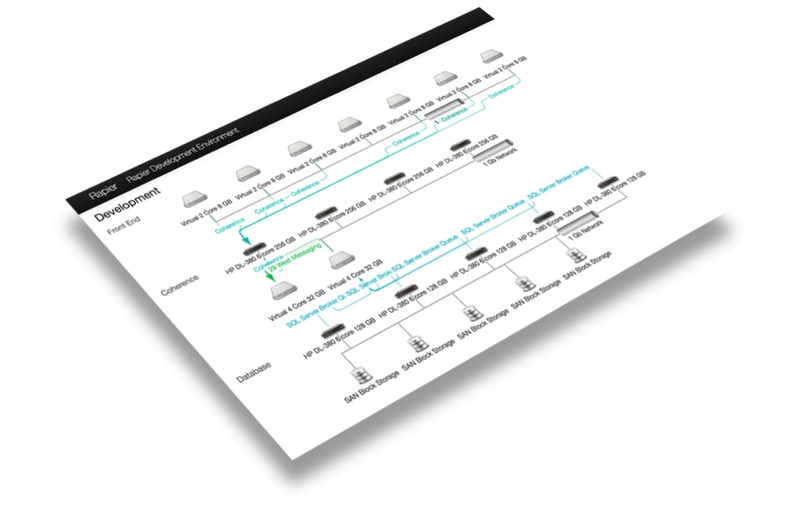 Describe your application deployment with a graphical topology in a browser. Version control and share your design with colleagues, creating enterprise assets ready for reuse. Select a template and create your document by filling-in the fields. Fabric adds as many details as possible, such as including the design and keeping an audit trail. Choose the design and add ownership details. 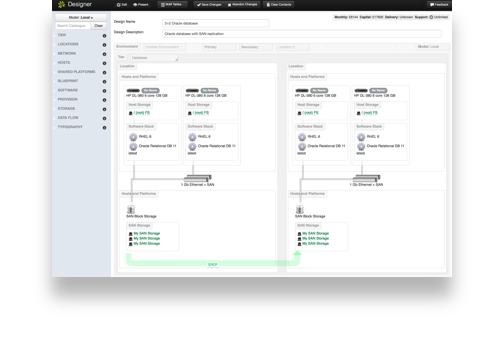 Fabric creates an orchestration script, dispatches it to the infrastructure provider and tracks the progress. You are notified by push message when its all done! Make big data more dynamic by rapidly building custom infrastructure. By arranging processing, software stacks and storage components, one can create analytics scenarios that can be closely optimised to the business process. Algile infrastructure without losing control. By democratising the creation and evolution of infrastructure, enterprises can become nimble. Unnecessary overheads can be shed whilst keeping cost awareness and architectural control. Fabric is a balance between the freedom of design and the discipline of cost control. With System Garden, only standards are possible and the impact of the design is calculated as you build. Once a design has been saved, the account holders can build it with the push of a button. From design to running system in minutes! 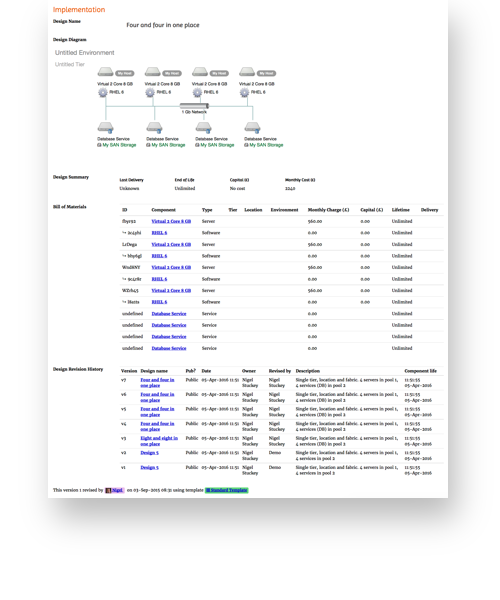 The designs are data and Fabric compiles into commands for each infrastructure provider. Designs can only be built from parts in the catalogue, thus ensuring that only standards are used. The age of each component is tracked to keep within support, further lowering costs. Independent of vendor, Fabric utilises cloud providers but also embrases conventional techniques as well to deliver a comprehensive platform for enterprises of all sizes at the availability you need. Fabric allows the simplification of process, transparency of purpose and the minimising of cost. Fabric is cloud aware, so your apps don't have to be. When you start designing, start from one of the standard catalogs (aka technical reference models) provided in System Garden and directed at specific vendor. For internal data centres or custom deployments, create your own catalogues based on internal engineered standards or buy in the expertise from an engineering consultancy. Completed designs can be built at the touch of a button straight from the platform. All the popular vendors are supported and using permitted self-service there is no hold-up. By using established orchestration tools, (such as Ansible and others) Fabric can leverage power, flexibility and integration. System Garden is a framework of many cooperating apps and a platform for custom tools with integration into enterprise technologies. Be told on your phone, email or chat channels when artefacts change or processes take place. Allow your colleagues to review your designs and documentation in comments attached to artefacts. Bill or advise your internal customers with a cost recovery app that reports deployment charges against applications. Set your own charges to cover tricky costs like networking to keep design estimates more accurate. Cut errors and save time by creating monitor, status and configuration diagrams for dashboards directly from the deployed design. Security credentials are kept encrypted at rest and in motion for security whilst allowing authorised self-service. Fabric consists of modular tools that combine to give comprehensive coverage. Each can be permissioned to adapt to the needs of each enterprise and the roles of work teams. The designer is a browser based graphical tool that allows components from your catalogue to be dragged into data centre locations and combined with application software. The designs are versioned and shared amongst your colleagues or secured within a small groups if needed. Your community can comment to create the best design possible. Costs are automatically accumulated to show the cost as it evolves, ensuring that there are no surprises. Each project you encounter needs more than design. It needs documented requirements and constraints, interested people, resources and justifications to be logged. System Garden provides an integrated document system that uses templates for structured prose. The directed documentation is concise, faster to complete and forms an audit asset. Templates and documents are versioned for long term maintenance and can also be accessed via API. Deployment is as simple as selecting the design and filling in some extra detail. Once the request is dispatched to the target infrastructure provider, System Garden tracks the progress and informs the requestor when it is ready by SMS, push alerts or email. For integrated devops, deployments can be requested via API and can also provide a call back hook. 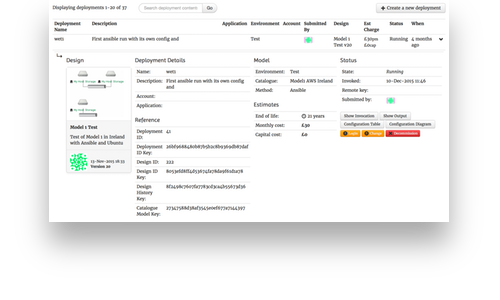 The completed deployment gets configuration status and monitoring pages generated automatically. System Garden Fabric provides agile infrastructure and integration to Enterprises large and small. 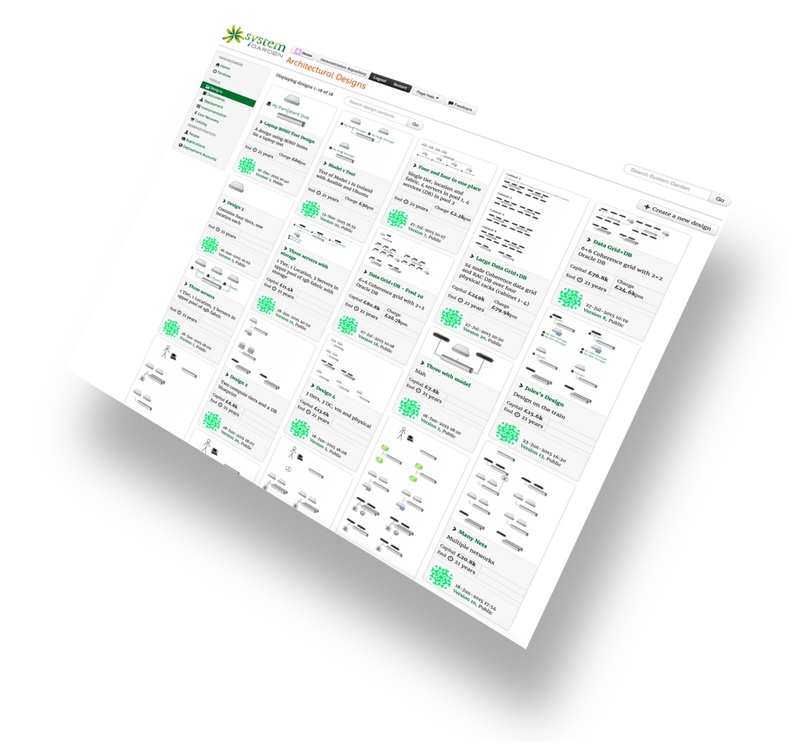 Visual design, templated documentation and click through deployment lead to outstanding productivity with standards. The products, functionality, service, support, licenses and prices described in this web site are subject to change and alteration without notice.